Let's explore some Mountain Bike trails a bit further afield, at the Wombat National Park, just out of Woodend. We will do a loop, aiming to take around 2 hours to complete. The distance we cover will depend on the speed of the group and number of stops. A representative from the local Woodend MTB club will also be on hand to help guide us around the trails. They will also be providing us with a free BBQ and soft drinks after the ride! (please message me if you are vego or vegan). *Please note, if Wombat trails are too wet, we will go to Gisborne instead. Breeze ride - for women and their guests. Meeting Location: Wombat State Forest MTB track carpark, at junction of Boldiston Rd & Fingerpost Rd, Woodend. 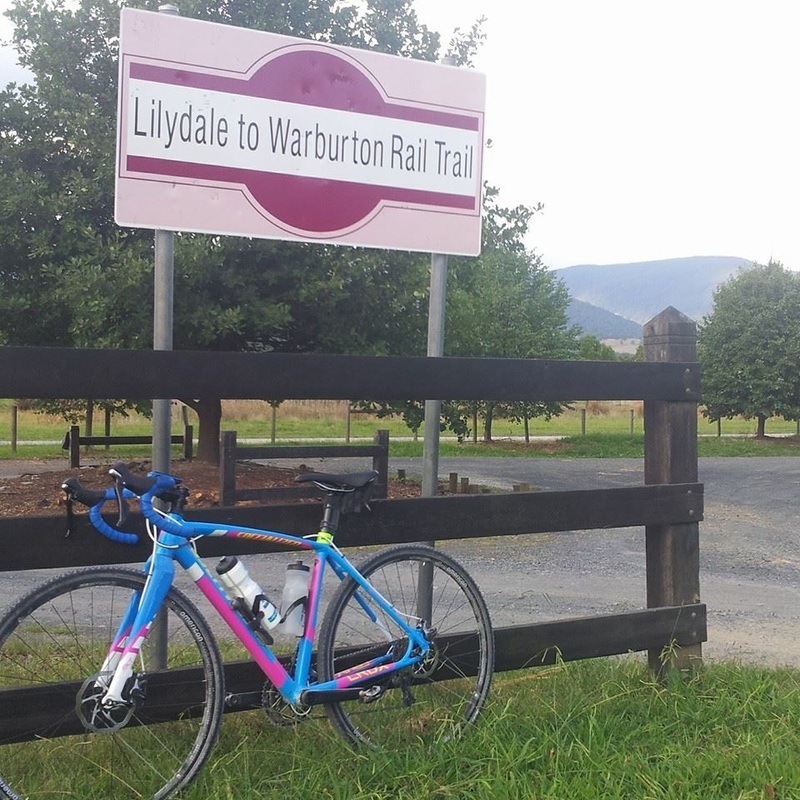 ​*Optional - take the train to Woodend, and get a lift out to the trails. Contact me if you wish to arrange this! Skill Level: MTB Beginners are welcome, must be able to ride single-track or willing to try. Bring Your: Serviced mountain bike, helmet, a spare tube to suit your tyre size, water/drink. Optional: spray jacket in case it rains, lights, basic bike tools, plenty of snacks. Explore the hilly streets of Melbourne's inner north-eastern suburbs. No-drop ride, intermediate riders (it's very hilly). The distance will be 53km (820m elev) and will take approx 2.5 to 3.5 hours (depending on the group), followed by a coffee at Fifteen Pounds Cafe, Fairfield. See you there! * Please note - although the ride does not finish back at the start point, I will ride with you back to the Guide Dogs after coffee if you need to return to your car there. ​Bike Type: Best suited to road bikes. Meeting Location: Outside Guide Dogs Victoria, Chandler Hwy, Kew. See map below. Melway ref 45 B1. ​See pictures below for detailed meeting instructions, and tips on getting to the start location safely from the Northern side of the Yarra. Terrain: On roads, some with bike lanes. A bit hilly. Skill Level: Able to ride on roads with medium traffic. Intermediate fitness – hilly terrain. Bring Your: Bike with bell and rear flashing light, helmet, spare tube to suit your bike, water/drink (ideally bring 2 bottles, though we can refill at servos). Optional: spray jacket in case it rains, front light, basic bike tools, snacks, cash for coffee/food after. Cost: $15 or FREE for Members - click here to Register online! Maximum of 10 places available. ​While this ride is for women, friendly male participants may participate as long as they acknowledge that they are participating as a "guest" only and do not set the pace. Please contact me prior to registration. Ride The Night - Australia's first ever mass-participation night-time bike ride! As the clock hits midnight on Saturday January 31, 2015, Melbourne will host Australia’s first ever mass participation night-time bike event. 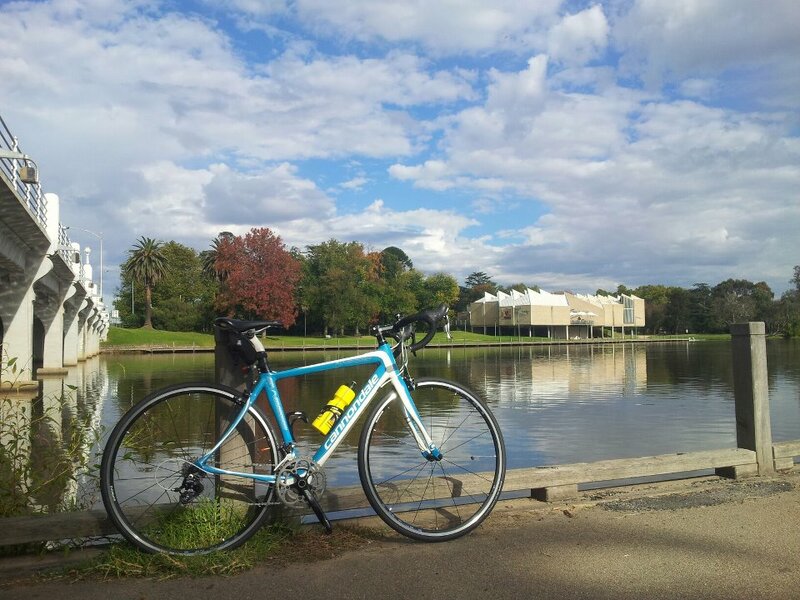 Sign up to ride with your mates in our unique event, which begins next to the Arts Centre and, over 70kms, takes you past the city’s best landmarks. Ride the Night is also a fundraiser, with the money supporting programs helping young Victorians “break the cycle of youth addiction”. Visit the website for more information. I have created a team for Bike It Better - when you register online, make sure you search for Team "Bike It Better" and join us! If you don't want to participate in the ride, but would still like to support our fundraising efforts, you can do so via this page. You can sponsor the whole team, or event better - sponsor a team member and help them reach their individual fundraising target! I will also be holding some fundraising activities leading up to the event, so stay tuned for more details. Want to participate but nervous about the idea of riding at night? Don't worry - I will be running a few shorter training rides in the dark to help address your concerns and allow you to see just how fun it can be! Need lights? Come down to The Ride Cycles in Kew East, we have a great selection and can help you find a light to suit your needs and your budget. 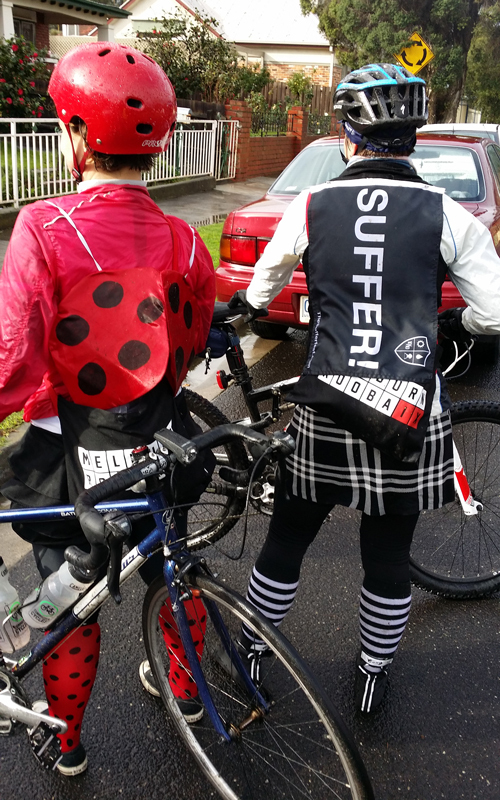 On 29th June, many intrepid souls (including Nyunkia and myself) braved the cold and rainy weather to participate in the 2014 Melburn Roobaix. At registration, participants are given a map, and manifest and a sharpie marker. The whole route is approx 35km and takes in many little back streets of our fair city, including many cobblestone alleyways! It's not a race - you have 4+ hours to complete the course, and along the way complete marked "segments" and look for a letter marker, which you note down on the manifest with your sharpie marker. If you have a complete and correct manifest at the end of the ride, you can go in the draw to win 2 tickets to Paris to watch the "real" Paris Roubaix!! (much of which is raced on the cobbles of France). I'm sorry to say that neither Nyunkia or I won the big prize. Most of the participants dress up in costumes of some sort. Highlights for me were the 2 guys on a tandem to which they had added some things to make it look like Thomas the Tank (check pg 2-3 of The Age from 1st July for a photo! ), the couple dressed as Coyote and Roadrunner, and many people in various animal (and even a chewbacca!) onesies. Along with the many costumes, the course itself was also interesting and very entertaining. I was really impressed by the behaviour of most of the riders, who were for the most part friendly, kind and courteous. The cobbled alleyways were muddy and quite wet in parts - I was glad I did the ride on my mountain bike, so much fun bouncing around and getting mud everywhere! I have to say I haven't had this much fun on my bike in a long time, even in such terrible weather. You all have to come along next year - I promise you will love it!!! Nyunkia and I in a brief moment of sunshine. Social pace, all levels welcome. Monthly Breeze road ride for women - 1st Saturday of every month (unless otherwise noted), starting at 7:30am from PhysioHealth 308 High Street Kew. Suitable for intermediate riders, this will be a no-drop ride, for road bikes (curly handlebars) only. 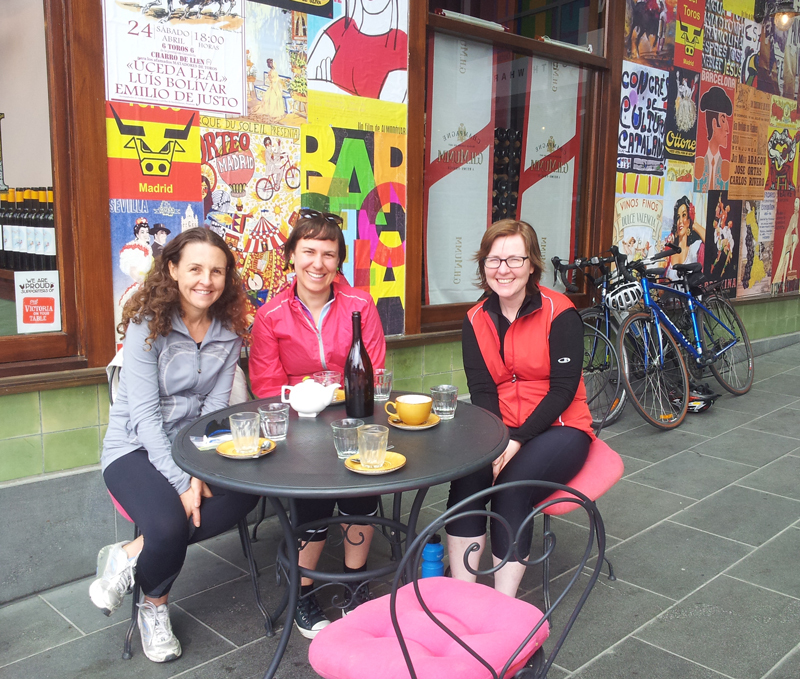 The distance will be approx 32km and will take approx 2 hours, followed by a coffee at Little Boy Blue. I hope to see some of you there! PhysioHealth Breeze Road Ride - Northern Hills loop. Meeting Location: 308 High Street, Kew. Skill Level: Able to ride on roads with medium traffic. Intermediate fitness - hilly terrain. Bring Your: Bike with bell and rear flashing light, helmet, spare tube to suit your bike, water/drink. Optional: spray jacket in case it rains, front light, basic bike tools, snacks, cash for coffee. Upcoming Dates: Sat 28th March, Sat 9th May, Sat 6th June. * Check Facebook or Twitter in the event of inclement weather. 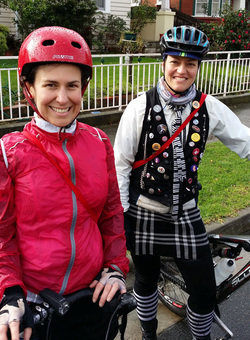 New weekly Breeze road ride for women - every Wednesday morning*. Suitable for beginner to intermediate riders, this will be a no-drop ride, for road bikes (curly handlebars) only. The distance will be approx 22km and will take 1 hour, followed by a coffee at 15 Pounds Cafe. See you there! 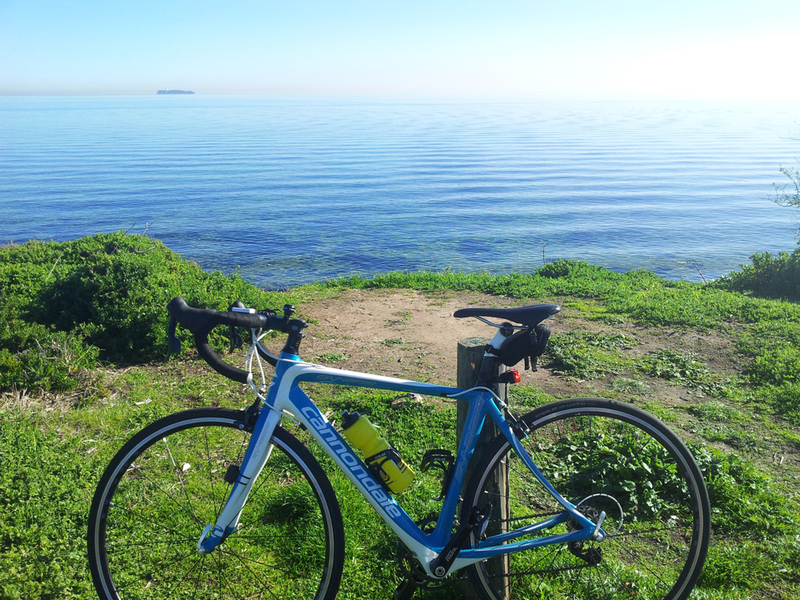 Wednesday Morning Breeze Road Ride - Darebin loop. Meeting Location: 15 Pounds Cafe, 21 Railway Place Fairfield (opp Fairfield Station). Terrain: Roads with medium traffic, and Darebin Creek Trail. Skill Level: Able to ride on roads with medium traffic. Beginner to intermediate. If you have not been on a ride with me before, please also download this form (below), fill out and bring along with you to the ride. * Please note: While the ride will probably happen every Wednesday (weather permitting), but it will only be a "Breeze Ride" (ie, with registered ride leader and insurance coverage) when Cazz is in attendance. Check Facebook or Twitter for current ride details, and in case of inclement weather. In the meantime, I would encourage you all to get together and organise rides, and check out a few of the other great groups that are around - links below. And please, don't forget to invite me on your rides!! Beer Break at Bonnie Doon! Beach Road on a beautiful day! This is a ride format designed for riders who have commuter or hybrid style bikes, and don't feel quite up to coming on the road ride, but don't want to ride on the dirt or gravel either. All other bike types are also welcome. Over the course of the rides we will explore some of the many trails and paths around Melbourne. On this ride we will explore the Gardiner's Creek and Anniversary Trails, forming a loop. Meeting Location: Cafe Bacino, 1335 Burke Rd Kew East. Day/Time: Sat 1st Nov, 2pm start. Terrain: Paved paths and trails. Roads only if we can't avoid them. Bring Your: Bike with bell, helmet, spare tube to suit your bike, water/drink. Registration essential - Click here to Register and Pay Online! * Subject to a minimum of 2 participants, and a maximum of 8. Trail/Path Ride: Saturday 8th November 7pm - Nite Rider!! The first night-time training ride for Ride The Night. 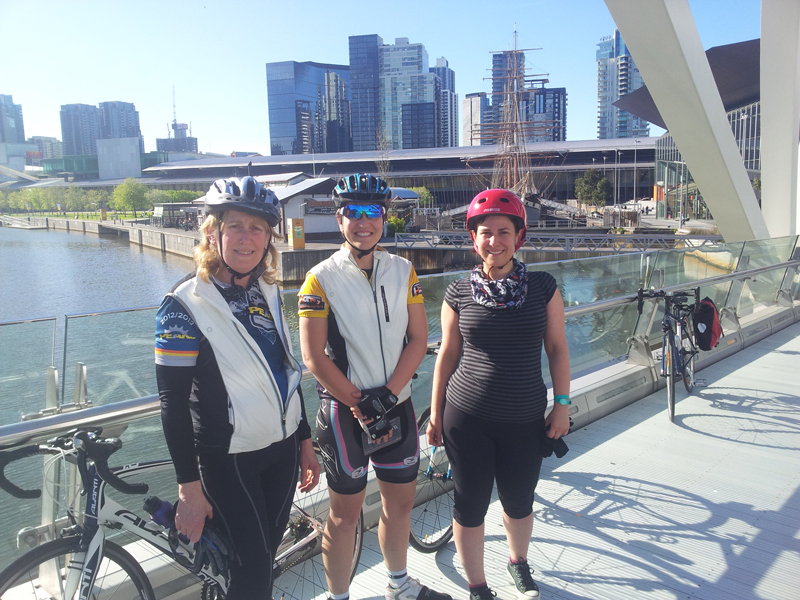 We will cruise along the Yarra Trail into Southbank, through the city and then back out the top, taking advantage of some of Melbourne's bike lanes. Bike Type: Any bike type, lights required (front and back). Meeting Location: Yarra Bend Road, opposite Fairfield NMIT. (Click for map). Terrain: On public roads sharing with cars; medium traffic; bike lanes, bike paths. Bring Your: Bike with front and rear lights and a bell, helmet, spare tube to suit your bike, water/drink. Optional - spray jacket in case it rains, food/bars/gels. For our on-road ride this month, I have mapped out a challenging little ride through some of Melbourne's more 'lumpy' suburbs. Bike Type: Best suited to Racing or Road bikes. Fixie/hybrid and flatbar road bikes are OK too! Meeting Location: Cnr Fulham Rd & Wingrove St Alphington. (Click for map). Terrain: On public roads sharing with cars; medium traffic. 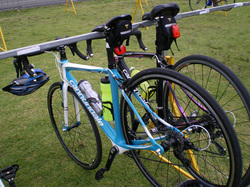 Bring Your: Bike with rear flashing light, helmet, spray jacket, spare tube(s), pump/Co2, water/drink, food/bars/gels. Registration essential. Contact me to register for this ride! This will be a challenging road ride for intermediate to advanced riders, with a fair bit of climbing. View route profile: http://ridewithgps.com/routes/4558125. Bike Type: Best suited to Racing or Road bikes. Meeting Location: Eltham Lower Park, 570 Main Road Eltham. Meeting Location: The Basin. There is a car park just along Forest Road from the main roundabout, we will meet there. Toilets available. * If you need to take public transport, please contact me prior to the ride. We can meet a little earlier at Bayswater train station and ride out Mountain Hwy to the start point. Please note this is a busy road. Day/Time: Easter Sunday 20th April, 8am start. Distance Options: 20km for the "1 in 20" only (The Basin to Olinda). Add 8km to include SkyHigh loop. Cost: $10. Registration essential - please email info@bikeitbetter.com. This way I can let you know if the ride is going to be cancelled due to weather or otherwise! Here is another opportunity to tackle Humevale Hill - great training for the Whittlesea Challenge! We will meet out the front of Bike'n'Bean, 797 Plenty Rd South Morang (plenty of parking available, or catch the train from the city to South Morang train station if you don't want to drive). 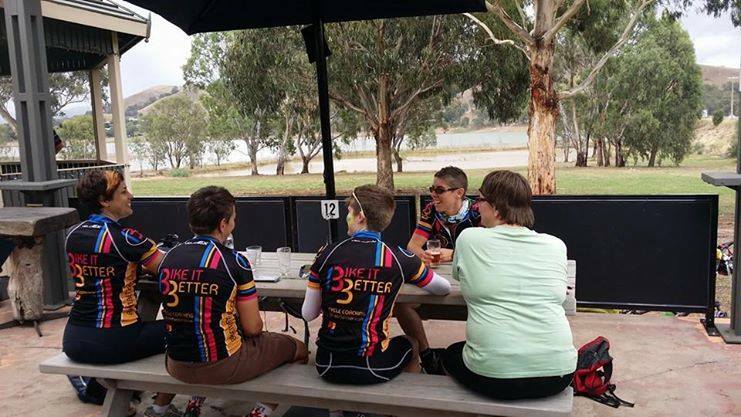 The full ride is 60km - if you want a shorter ride, there are options to meet the group at Mernda, Yan Yean or Whittlesea. Meeting Location: Out the front of Bike'n'Bean, 797 Plenty Rd South Morang. Car parking available. * If you need to take public transport, catch the train to South Morang station and ride a short distance to the start point. Day/Time: Sunday 27th April, 8am start. This will be a lovely road ride with a tour of the back roads of the north, with a few little hills thrown in. 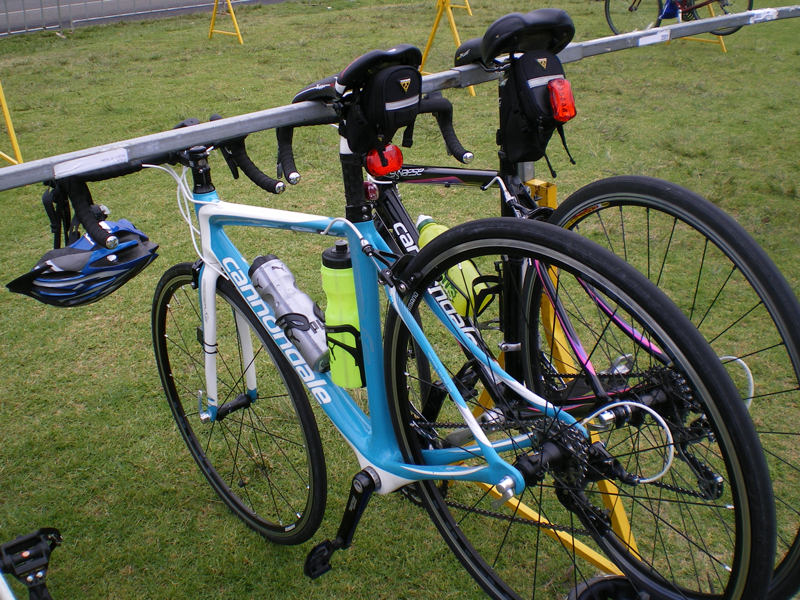 Bike Type: Best suited to Racing or Road bikes, flat-bar roadies also welcome. Bring Your: Bike with rear flashing light, helmet, spare tube to suit your bike, water/drink, spray jacket in case it rains, food/bars/gels. We will visit the classic Melbourne cycling route - Kew Boulevard - and extend on through the lovely Yarra Boulevard as well! Hopefully avoiding the tacks on the road. This is a ride format designed for riders who have commuter or hybrid style bikes, and don't feel quite up to coming on the road ride, but don't want to ride on the dirt or gravel either. All other bike types are also welcome. Over the course of the rides we will explore some of the many trails and paths around Melbourne. On this ride we will explore the Koonung Trail. Day/Time: Sat 28th June, 8am start. This is a ride format designed for riders who have commuter or hybrid style bikes, and don't feel quite up to coming on the road ride, but don't want to ride on the dirt or gravel either. All other bike types are also welcome. Over the course of the rides we will explore some of the many trails and paths around Melbourne. On this ride we will explore the Darebin Creek Trail, an out-and-back loop for 1.5 hours. Day/Time: Sat 19th July, 7:30am start. Day/Time: Sat 2nd Aug, 8am start. This is a ride format designed for riders who have commuter or hybrid style bikes, and don't feel quite up to coming on the road ride, but don't want to ride on the dirt or gravel either. All other bike types are also welcome. Over the course of the rides we will explore some of the many trails and paths around Melbourne. On this ride we will explore the Capital City Trail, forming a loop around the city. Meeting Location: Yarra Bend Rd Fairfield, out the front of NMIT Fairfield Campus. Parking opposite the campus gates, and along Yarra Bend Rd. Day/Time: Sat 19th July, 7am start. Day/Time: Sat 21st June, 8am start. We will explore some of the great trails right on our doorstep - The Yarra Trails near Ivanhoe. Day/Time: Saturday 29th March, 1pm start. Terrain: Mixture of paved paths, gravel & dirt trails. * "Single-track" options for more adventurous riders! Bring Your: Bike with bell, helmet, spray jacket in case it rains, spare tube to suit your bike, water/drink. We will meet at Lilydale train station and jump on the Rail Trail. To get to the start point you could catch a metro train from the city, or drive and park at Lilydale Station. Alternate start points - if driving, you may choose to meet us at Mt Evelyn which would reduce the amount of climbing involved, and reduce the overall distance. Email me for more information. Bike Type: Anything suitable for riding on gravel. Day/Time: Sunday 22nd February, 9am start. Skill Level: Any, as long as you are comfortable with the distance. Bring Your: Bike with bell, helmet, spare tube to suit your bike, water/drink, cash/card for lunch. Optional: spray jacket in case it rains, snacks, sunscreen, camera, coffee maker. Bikes taking a well-earned break! Breeze skills sessions are targeted toward beginner to intermediate bike riders - but riders at all levels can benefit from developing their bike handling! Skills sessions are for women - male participants are also welcome, but must acknowledge that they are participating as a "guest" only and do not set the pace. Skills covered: Bike safety check, using gears effectively, climbing and descending. More skills will be covered in future sessions! Skill Level: Beginnner/Intermediate, but all levels welcome. Bring Your: Bike, helmet, spray jacket in case it rains, spare tube to suit your bike, water/drink.